As Infrastructure Crumbles, Trillions Of Gallons Of Water Lost The nation's aging pipes and water mains are springing expensive leaks, wasting more than 2 trillion gallons of drinking water nationally and 22 billion gallons in the Chicago area alone. 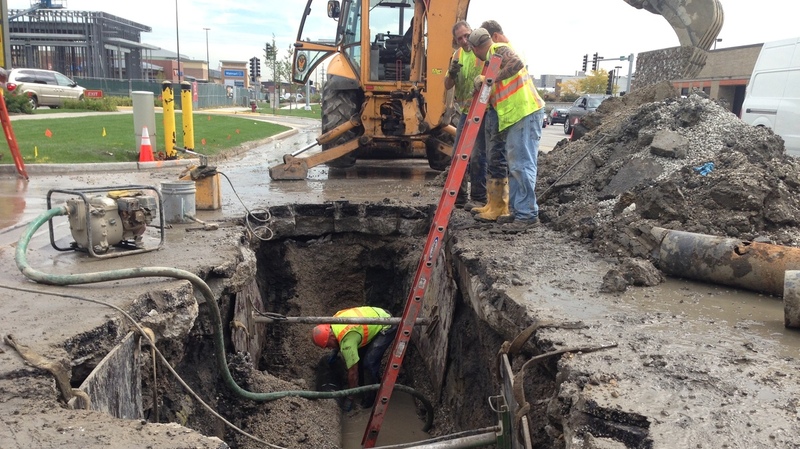 A water maintenance crew works on leaky infrastructure in Skokie, a Chicago suburb. The area loses almost 22 billion gallons of water a year because of ailing infrastructure. In Chicago, fresh water is drawn into water intake cribs in Lake Michigan and piped to the enormous Jardine Water Filtration Plant on the lakefront, adjacent to Navy Pier. Jardine is the largest water filtration plant in the world by volume, pumping about 1 billion gallons of purified drinking water out through hundreds of thousands of miles of pipes to 5 million people in Chicago and 125 surrounding communities. But not all of that treated, potable water makes it through the system to homes and businesses. In fact, quite a bit of it is lost. The Chicago-based Center for Neighborhood Technology, a nonprofit focused on sustainability, recently put out a report that estimates "about 6 billion gallons of water per day may be wasted in the U.S.," says Danielle Gallet, the group's water supply program manager. Where does it go? 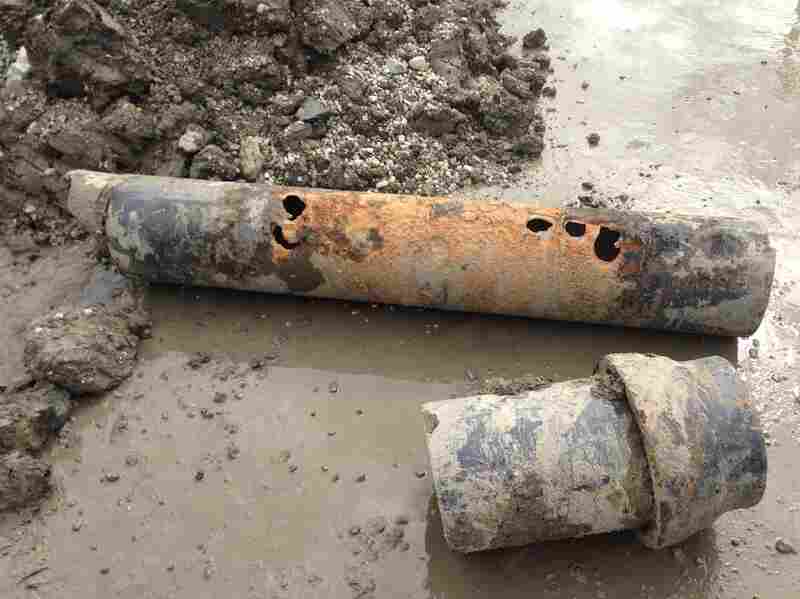 Much of it just leaks out of aging pipes and water mains that crack and break. "We do have a crumbling infrastructure issue," Gallet says. "It is old." Water maintenance workers in Skokie, Ill., replaced 6 feet of a 10-inch-wide water main that had golf-ball-size holes in it. Last winter's extremely bitter cold in the Midwest and Northeast was especially tough on the aging water infrastructure in those parts of the country. But water main breaks are becoming increasingly common in warmer months too. "We replaced 6 feet of main here [of a] 10-inch main," that burst open 5 feet beneath a busy thoroughfare in the Chicago suburb of Skokie, says Perry Gabuzzi, a maintenance worker for that city's water department, one recent warm morning. "See the golf-ball-sized holes in it?" he asked, pointing to the section of pipe his crew removed. The rusted pipe broke open just because of old age. Gabuzzi and his colleagues estimated the section to be at least 70 years old. In Los Angeles in July, a water main estimated to be 93 years old broke wide open, causing severe flooding on the campus of UCLA. And these kinds of incidents are happening all over the country, as much of the nation's water infrastructure is now a century old. "The infrastructure and the massive investment that our grandparents, great-grandparents, some of us our great-great-grandparents put in, is coming to the end of its useful life, and the bill has come due on our watch," Gallet says. But some government spending watchdogs are skeptical. "Anytime somebody tells me that we have to spend more money, I'm going to look at who is telling me that and do they have an interest in it," says Steve Ellis of the Washington-based group Taxpayers for Common Sense. He says water utilities stand to gain from massive water infrastructure spending, as does the American Society of Civil Engineers, which gives the nation's water infrastructure a barely passing grade of "D."
Ellis says that doesn't mean big spending on water infrastructure isn't needed. Voters just need to make sure there's proper oversight, as well as investments in better technologies and conservation. The American Water Works Association is meeting in Atlanta this week in its first conference focused on water infrastructure. LaFrance says the first priority is to get water utilities to audit their systems and install and upgrade meters where needed. Then they can get a better handle on just how much water is being lost because too many, he says, just don't know. And in the meantime, the old and crumbling pipes keep leaking.